Fr Peter Hung Manh Tran was born in South Vietnam. After migrating to Australia as a refugee in 1982, he joined the Redemptorist Order and was ordained a priest in 1994 in Melbourne. He obtained a Bachelor of Theology in 1992 at the Melbourne College of Divinity through Yarra Theological Union. He then qualified with a Master of Theology in 1998 from The University of Notre Dame Australia (Fremantle Campaus) and was awarded the Doctor of Moral Theology in 2003 at the Alphonsian Academy, Pontifical University of Lateran, Rome. 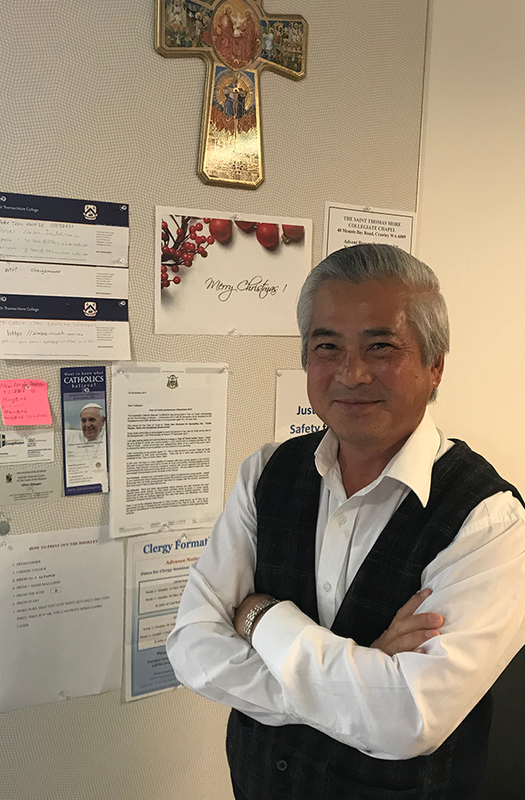 Father Peter began his academic career as a lecturer in July 1998, when he was invited to go back to Vietnam and taught Moral Theology and Bioethics at the Redemptorist Seminary and also at several major Diocesan Seminaries in Vietnam. Over the last twenty years he has published articles and books on various bioethical issues. His current interest is in the area of stem cell research. For nearly a decade, he worked at the L.J. Goody Bioethics Centre in Western Australia as a Consultant, as well as continuing his teaching as a visiting lecturer in Moral Theology and Bioethics at the Good Shepherd Theological College in Auckland – New Zealand. In October 2017, Fr Peter was appointed to be the Chaplain at St Thomas More College and UWA.